The data have been taken from various researches and based on the year 2013. With 34 million mobile subscribers Malaysia has the youngest mobile internet user base in South East Asia (SEA).The percentage of mobile phone users by age below 18 years old is 13% and 33 % of Malaysia's mobile internet users are from 25 - 35 when 31 % (18-24) and 22% ( above 35). Smartphone penetration in Malaysia is now 51%, according to the Google - Study, shows that every 1 in 2 adults in Malaysia are smartphone users. Besides that, the report also reveals that Malaysia has one of the highest Male to Female ratio among mobile internet users, only next to Viet Nam (63 %: 37 %). The report says Malaysia has lowest proportion of graduate / post-graduates in the mobile internet user base. Users are holding Diploma / Undergraduate account of 40% of Malaysia mobile app users when only 24% of them are Graduate / Post Graduate. According to the report, Malaysia has one of the highest proportion of full-time employees in the mobile internet users base in SEA when 46% of Malaysia mobile app users are Full time job, and only 16% of them are Student and 9% are Business man. Mobile content downloaded in Malaysia is lesser than the regional average whereby 59 % of Mobile content which Malaysian downloaded is Game / App, followed by video only 45 %, 42 % - music and 30 % - themes. 80 % of Malaysian users stream or download videos each month whereby 51% of Malaysian have an active YouTube profile. YouTube accounts for 67% for all online videos viewed in Malaysia out of an audience of 9.3 million. 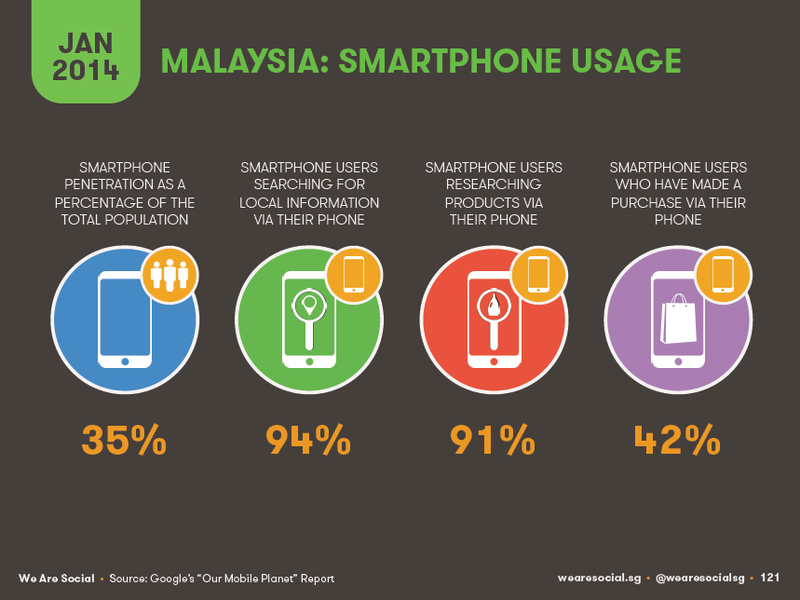 Over half of mobile ad viewer from Malaysia stated that mobile ad has helped them in downloading mobile content. When 44% Malaysia want to find a good deal on something from Mobile ad and 34% want to learn about a brand. It's only 22% Malaysian want mobile ad help them locate something nearby. The report also reveals that, there is only 1 out of 8 mobile internet users from Malaysia went to all places - movie theatre, shopping mall / market and a restaurant, least in SEA. There are 57 % of Malaysian use mobile app for Shopping Mall / Market when 42 % of users will use for restaurant.